Perfect for anyone who wants to take their dog sport training to the next level. All abilities, training levels, and dog sport disciplines are welcome. This workshop will introduce you to the basics of training body awareness for the sporting dog. Using fun games and exercises, you will learn how to develop your dog’s body awareness, increase their strength and fitness, and work on motivation and focus. We will also work on bond building, impulse control, confidence building, and management of dog arousal level. You will leave the session with a new tool kit of training exercises that can be used alongside your existing dog sport training regime to get your dog fit, flexible, strong, and raring to go! 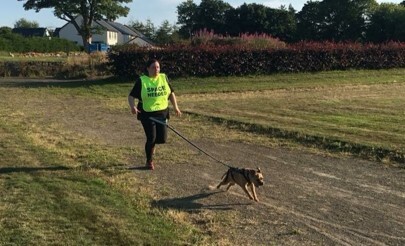 Nicola trains and competes with her two border terriers in Heelwork to Music and Canicross. She came to dog training eight years ago in order to find ways to manage her dogs’ reactivity, and now co-runs Kirk Dog Training Club in Irvine, teaching several trick training and pet obedience classes each week, from intake to advanced level, and trains with her own dogs in advanced work. Nicola is a member of the absoluteDogs Pro Dog Trainer programme. She is part of three times Crufts Heelwork to Music Champion Heather Smith’s Heelwork to Music display team. She also trains and runs her own HTM display team, Prancing Paws. Nicola’s youngest dog, Baxter, is a former Club Champion, and her eldest dog, Bonnie, is reigning Club Champion and a former Therapet of the Year.